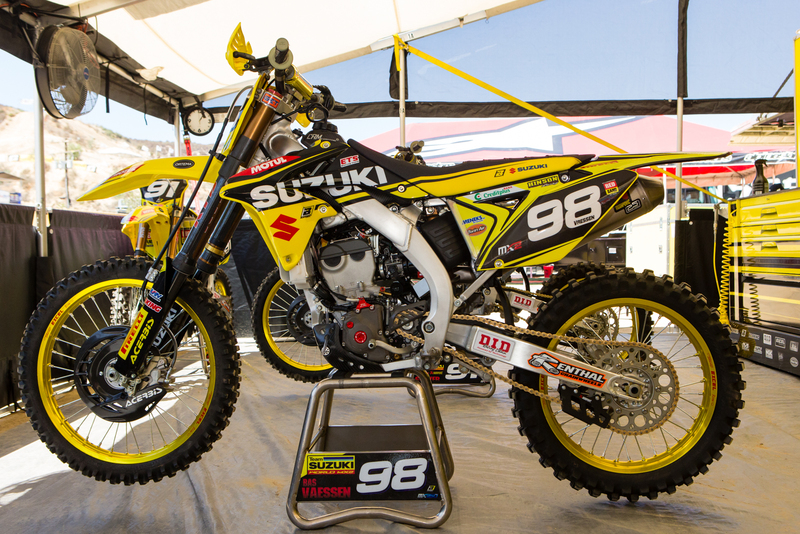 Suzuki World MX2's bikes were a big curiosity as Jeremy Seewer has been very competitive in 2016 and looks to be a title favorite heading into 2017. Along with the team signing a lot of young talent to fill up MX2 and EMX2 for the next few seasons. 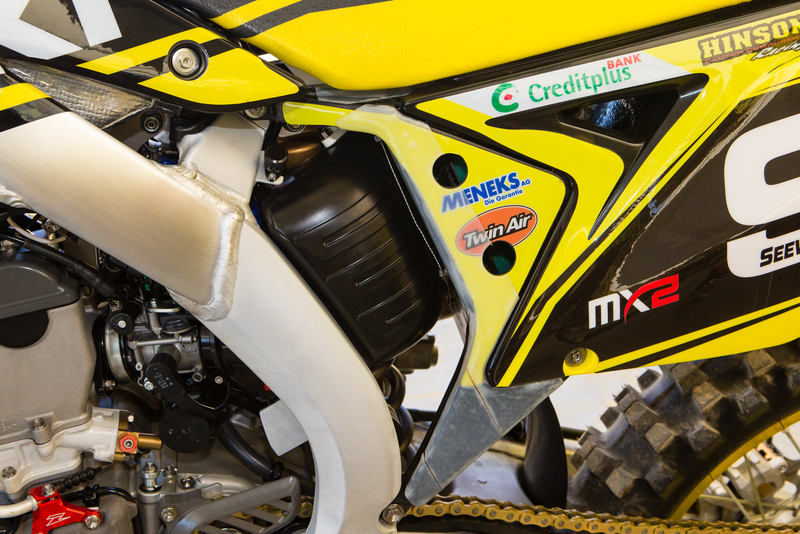 We all know that the stock Suzuki RM-Z250 is down a decent amount on power and we've heard that this team has a few tricks up their sleeves with the intake and cylinder head to get back to competitive numbers. The most obvious thing we found was a second injector kit by GET, mounted to the bottom of the airboot. With more fuel comes the need for more air, so Seewer's CRM carbon fiber subframe and airbox fills the need for some extra ventilation on both sides. We spotted a data logging input above the airboot. 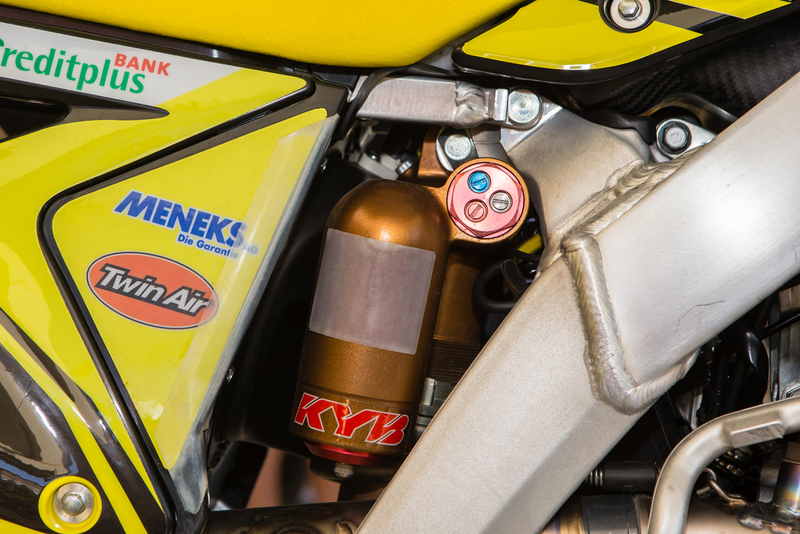 Akrapovic is definitely the most common exhaust system in the pits, even with heavier pushes from FMF, Yoshimura, and Pro Circuit into the GP scene. 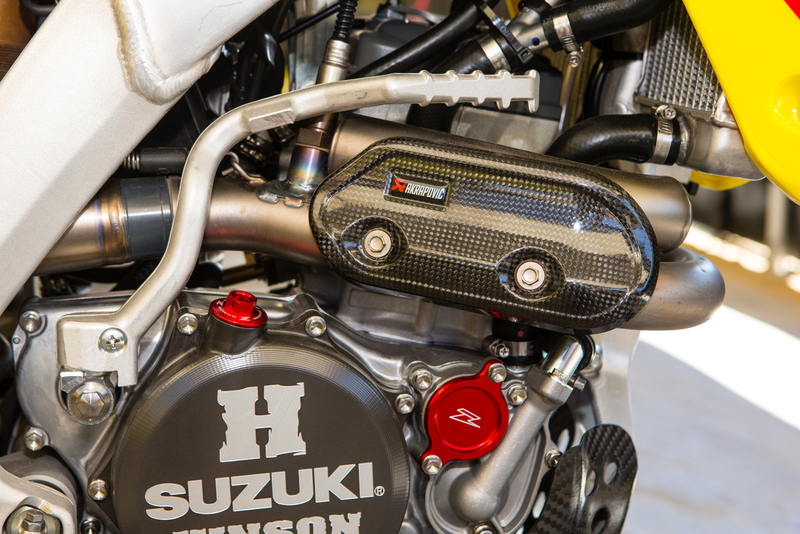 Each Akrapovic system is a mix of high-quality titanium, gorgeous welds, and trick carbon fiber. The seat bases and foam have also been cutout on the rear to allow more airflow, this is important for their second rider, Bas Vaessen, as his bike doesn't have the same airbox as Seewer's bike. Instead, he uses a stock subframe and airbox. Seewer's FatBar bar pad leaves a great hiding place for GET's newest info display unit. A little extra protection never hurts. 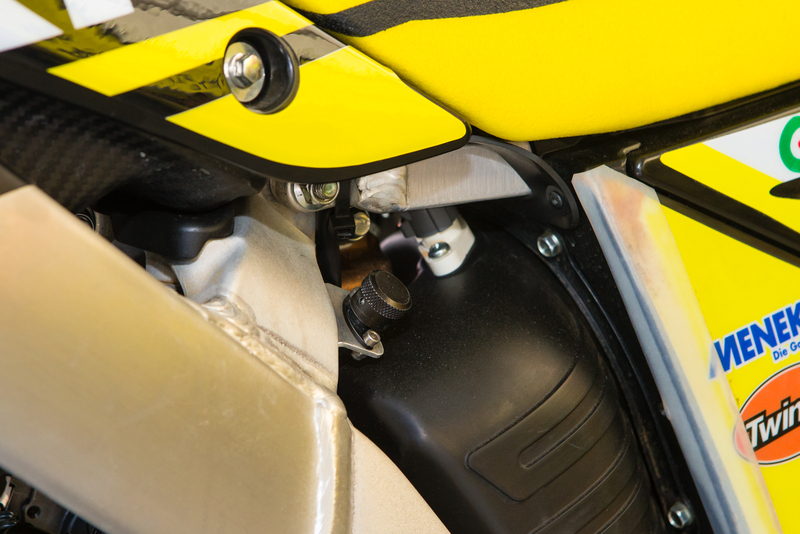 They've also changed the home of the bike's ECU to the right side frame, and replaced it with a GET unit as well. 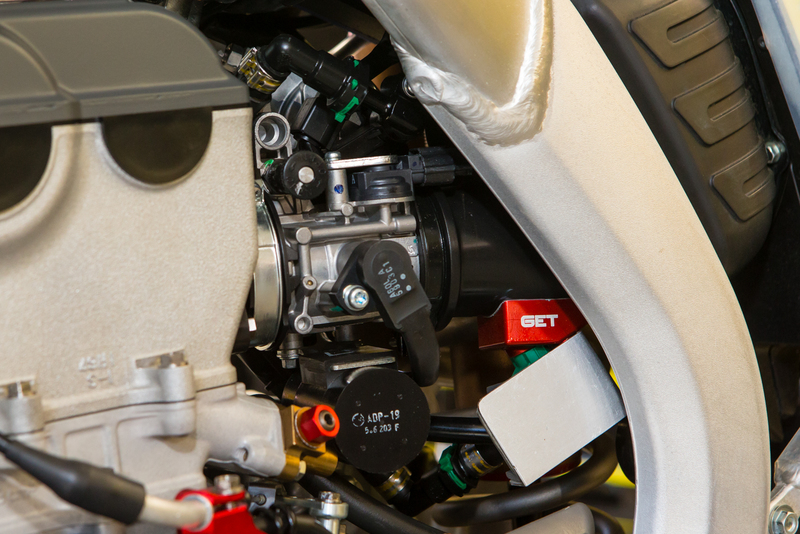 A look at the right side of Seewer's bike, allowing or another view of the airbox/subframe unit. 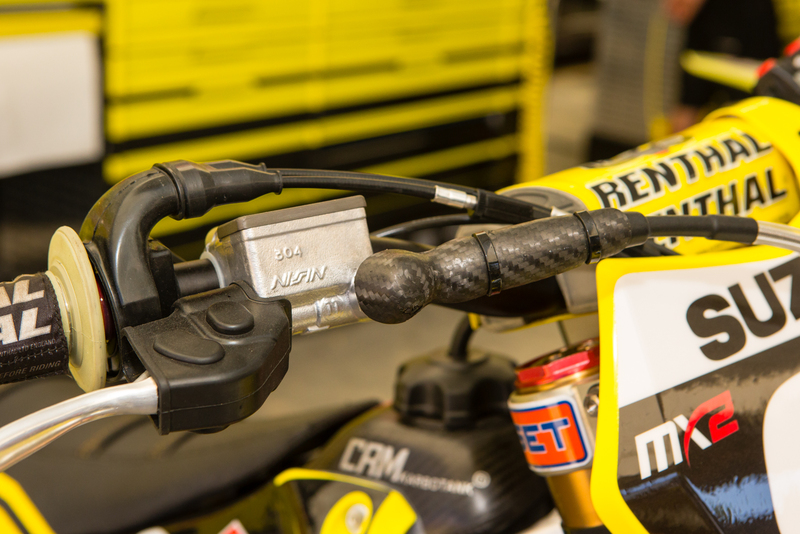 Like the 450s, the exhaust mid-pipe mount has been moved from the subframe to the back of the spar on the frame. 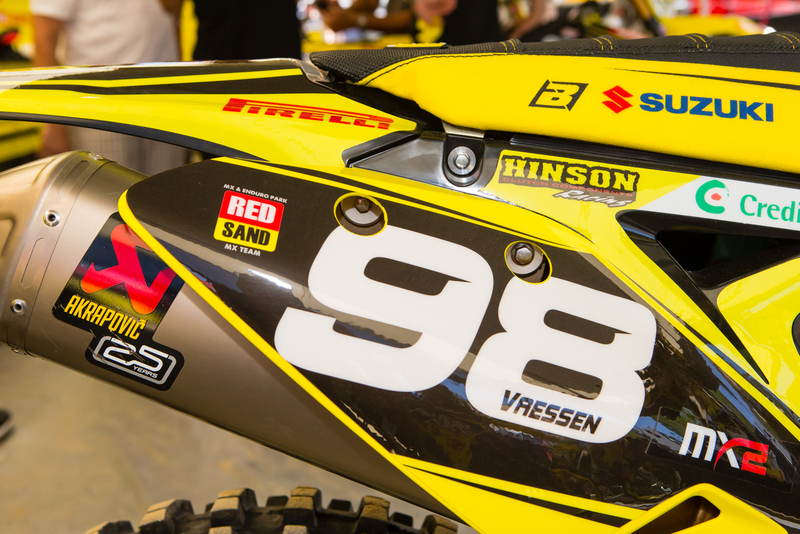 A look at Bas Vaessen's RM-Z250, which differs a bit from his teammates bike at the rear of the bike. 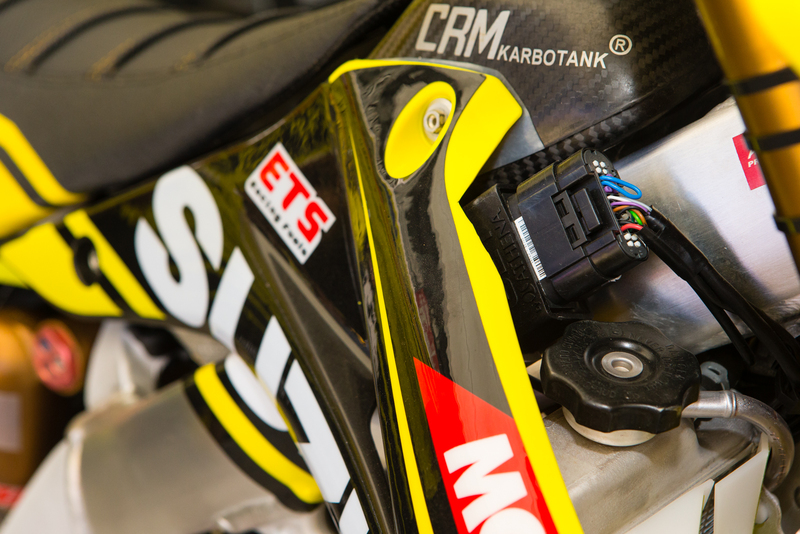 Like the MXGP squad, the MX2 riders are split on aluminum vs carbon fiber subframes. 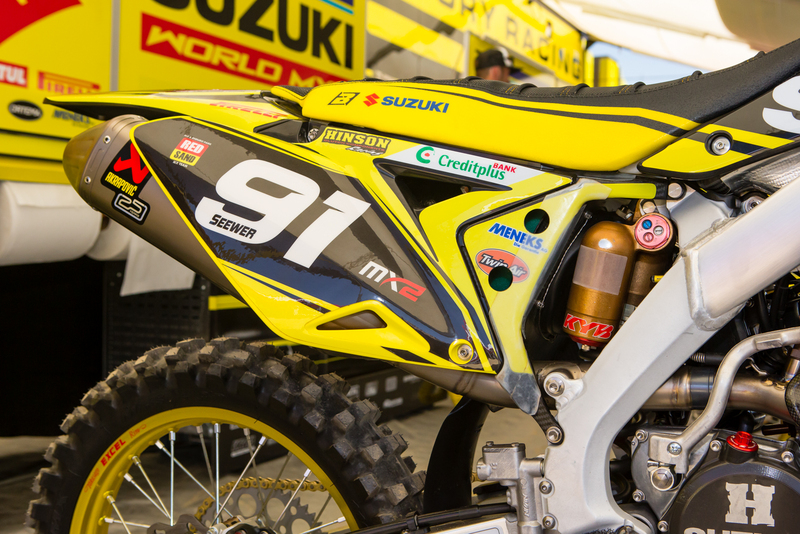 A common thing amongst US and MXGP Suzuki factory bikes is the exhaust mounting. 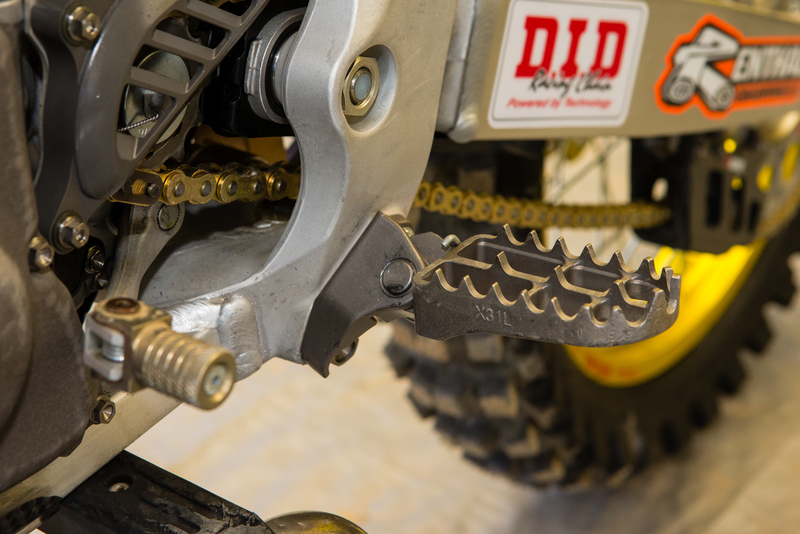 They mount the cans to both the normal spot on the subframe, along with using the rear hole that's normally mean for the rear fender to just mount to the subframe. 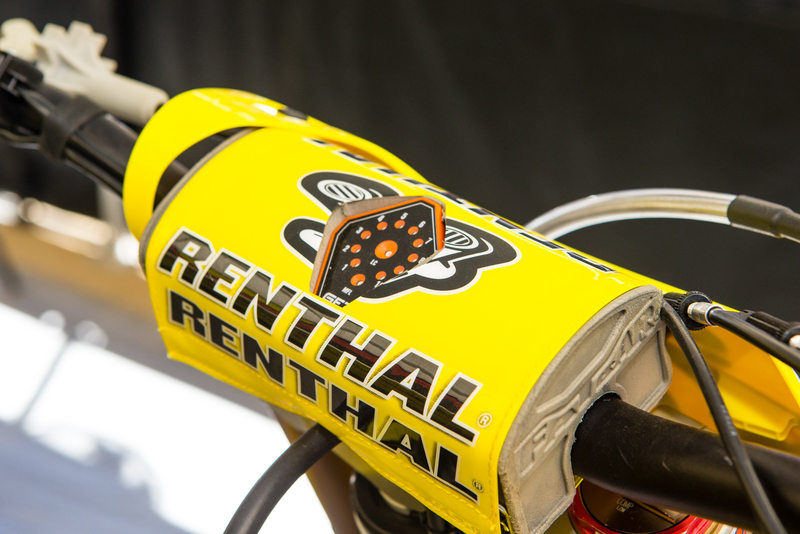 This is found on both Yoshimura and Akrapovic team systems. 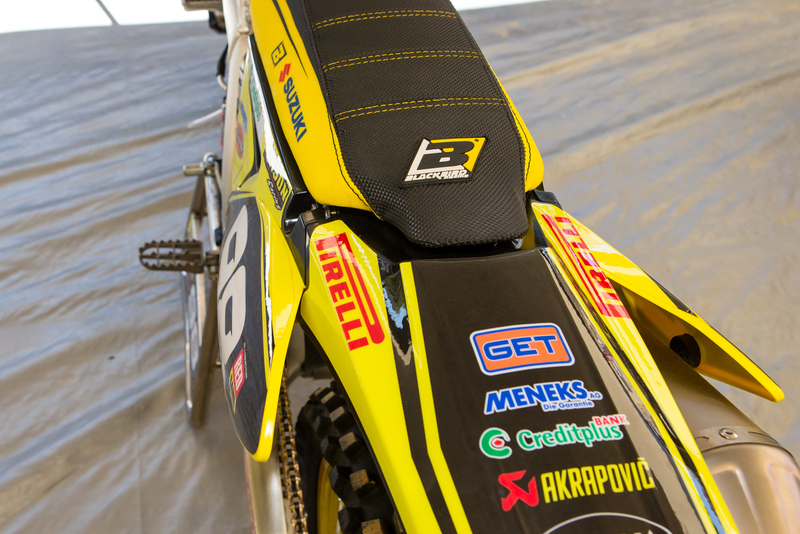 KYB shocks all the way around the Suzuki World MXGP and MX2 squads. 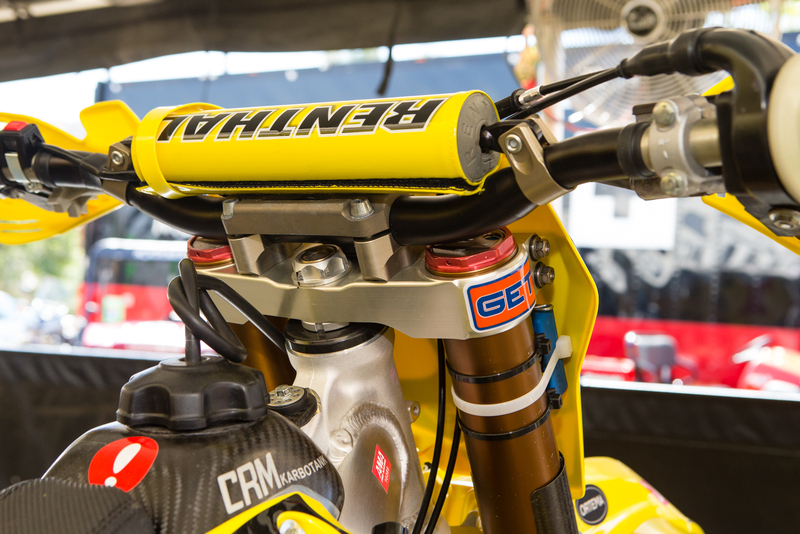 However, last year only the MXGP squad had the 48mm KYB PSF1 air forks, while the MX2 squad was using left over 50mm AOSS spring forks from prior seasons. This year though, all the bike were equipped with PSF1. Also, note the low bar mounts on the young Vaessen's bike. These pegs may not be made of titanium, but they sure are wide!